Qualitest offers extensive range of advanced plastics and Color testing equipment such as Portable Spectrophotometer - Spectro-Guide & Color-Guide which is used for total Appearance Control - color and gloss in one unit. Mobile Color Measurement. Store up to 200 standards with tolerances and 999 samples in the color-guide's memory and control color whenever and wherever it is needed. The overall appearance of a product is influenced by color and gloss. A sample of the same color but higher gloss level is visually perceived darker and more saturated than a low gloss sample. In order to get a uniform appearance, both attributes need to be controlled. 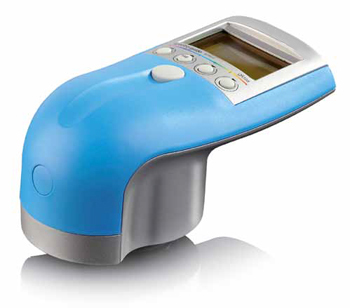 The spectro-guide spectrophotometer is unique as it measures both attributes simultaneously. Thus, the cause of a mismatch can be clearly defined in any situation. The spectro-guide spectrophotometer makes quality control simple and secure – even for color beginners. Thanks to the intuitive pulldown menu and the four-cursor button operation, quality control has never been easier. Most people consider color and gloss harmony of the car interior to be a key item when judging the perceived quality of a vehicle. Consequently, the quality requirements for the interior design of a car have increased over the last years. A variety of materials are used and need to be harmonized. To achieve a uniform look among the interior trim parts, very tight tolerances are specified. Only instruments with excellent precision are able to objectively control the production. When measuring powdery or granular material like raw material pucks or grainy food, the instrument's optics must be protected. The color-guide spectrophotometer with glass sealed aperture uses a colorless, optical glass and can directly measure such products, thus saving sample preparation time.